Some folks claim to not like fruit cake. 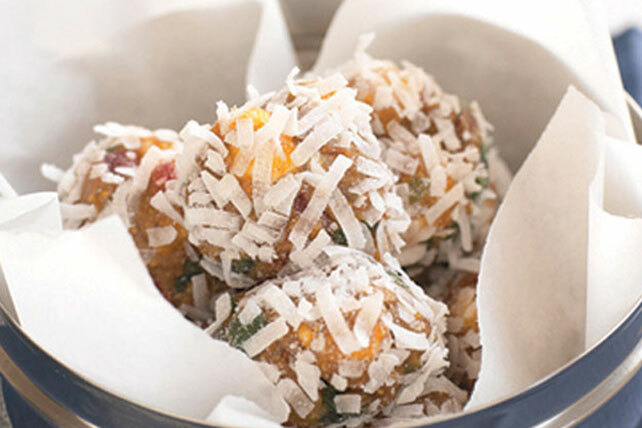 But no one ever turns down our scrumptious, coconut-kissed No-Bake Fruit Balls! Combine marshmallows, cracker crumbs, cherries, sweetened condensed milk and pecans; mix well. Shape dough evenly into 5 dozen balls, each about 1 inch in diameter. Roll balls in coconut until evenly coated. Refrigerate 3 hours or until firm. Store in airtight container in refrigerator. Use clean kitchen scissors to easily cut up the cherries. Use a small scoop or level measuring tablespoon to measure out the dough for the balls.